60 privately owned Perth pubs all with drive through bottle shops that form a WA cooperative buying and marketing group. Launch and establish an iconic, recognisable, stand-alone WA Liquor brand, promoting the brand’s key value proposition: Convenience of location. Convenience of shopping via drive throughs, Everyday low prices, Great specials, offers, promotions. 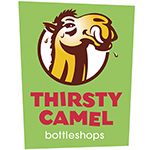 Trading very successfully as Route 66 Liquor for many years (Media Today managed this account also) it was time for a rebrand, this time joining a national buying group called Thirsty Camel Bottle shops. 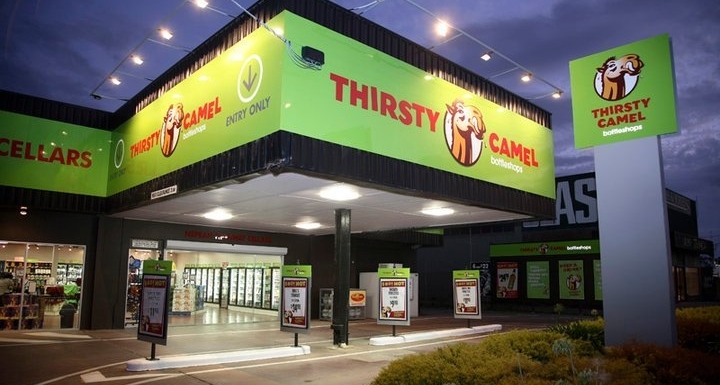 Thirsty Camel WA would 100% manage its own marketing budget, as a result Media Today, following many successful years as Route 66 Liquor’s Advertising Agency, was appointed to Thirsty Camel. The liquor environment like the white goods industry is extremely competitive, competition apart from local independent chains all with an aggressive approach to retail come in the form of multi nationals…. large liquor warehouses all focused on price point and value adds. We understood that making the launch around price and using ‘that old chestnut’ with the brand alone, would be the wrong move…. we needed something else. Convenience via drive through shopping was a key element and a creative that could deliver this advantage in a way that would cut through, engage and quickly develop traction was vital. Light bulb moment! !…and the opportunity became clear. Develop a brand that was in itself is a character with a real identity, a character that was irreverent, hilarious, a brand, a character that could make you laugh, make you listen because it engaged you one on one! And so The Camel was born! The Camel connected with the target market via humour…. the king of convenience and the jester of silly jokes…. the more ridiculous the better they worked! Television & radio ads creative: We developed a series of radio commercials and television commercials featuring The Camel in full character flight being self-deprecating, laughing, joking, telling stupid stories and delivering the weekly specials and key brand messages. Radio has been the most successful of all traditional media used to date…simple by targeting the drive time audience between 4pm and 6pm weekdays we made commercial breaks fun and we directed the traffic through Thirsty Camel Bottle shops on the way home instead of a liquor barn and car park. Creating, sourcing content and continuing conversation with THE CAMEL in a social setting. Promoting competitions and offers to precisely targeted audiences. Using the Facebook pixel to keep the conversation flowing, talking to engaged audiences (website visitors) and the client’s provided database list. The camel, the brand and those ads are haha-hard to ignore, which gives our client longevity and ensures that their brand goes from strength to strength. The brand launch was an enormous success and the brand still maintains a healthy market share 10+ years later. The Thirsty Camel brand is truly iconic and has enormous equity throughout WA. The market made the brand their own resulting in repeat business and sustainable growth….